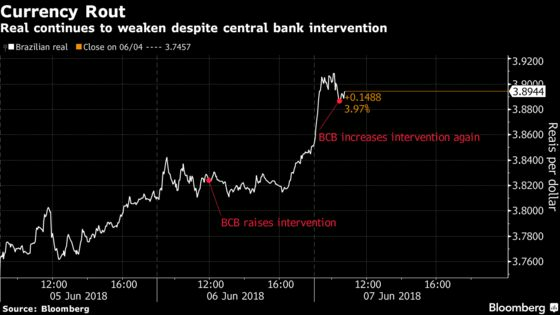 (Bloomberg) -- Turkey and Brazil intensified efforts to protect their currencies from speculative attacks by investors as emerging markets face their biggest test since the 2013 taper tantrum. Turkey surprised analysts by tightening monetary policy Thursday for the third time in less than two months, while Brazil’s central bank sold extra foreign-exchange swap contracts for the second time this week, boosting investors’ protection again further declines in the currency. The lira surged, while the real only briefly pared losses. A combination of a rising dollar, spiraling inflation, widening budget and current account deficits, and political pressure for lower rates spurred a flight from lira assets in May. 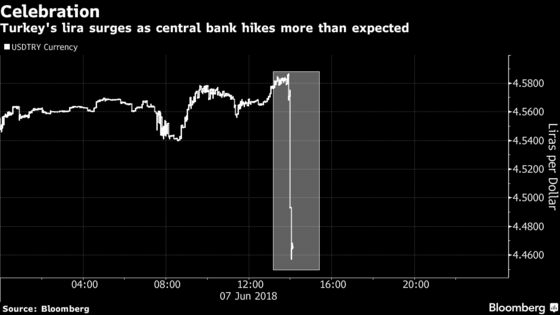 The central bank responded to the rout by first raising its late-liquidity window by 3 percentage points at an unscheduled meeting, and then announcing a decision to simplify its interest-rate regime. Today’s move sent Turkey’s lira up 1.2 percent to 4.45047 per dollar as of 2:33 p.m. in New York. In Brazil, policy makers sold an additional 40,000 foreign-exchange swap contracts Thursday to reduce pressure on the local currency, marking the second time this week it’s gone beyond its usual offer of 15,000 contracts daily. The real has tumbled 15 percent this quarter, the most among major currencies, amid an increasingly bearish view of the economy. The selloff picked up steam amid a 10-day truckers strike that paralyzed the country last month and sidelined much of the government’s efforts to rein in a fiscal deficit. Political uncertainty ahead of presidential elections in October and rising global interest rates have only added to woes. "There’s a huge concern over the electoral scenario and local investors are searching for safety," Goldman Sachs’ senior economist Alberto Ramos said. "It’s perfectly possible for the real to weaken to above 4.00 per dollar. There is nothing magical about that level." Economists have been slashing forecasts and now see Brazil’s economy growing about 2.2 percent this year, from a previous 3 percent, according to a survey from the central bank. More downside revisions are on tap, with JPMorgan Chase & Co. recently lowering its expansion call to a mere 1.2 percent this year. The real was down 1.3 percent to 3.9022 per dollar, after earlier falling almost 3 percent.